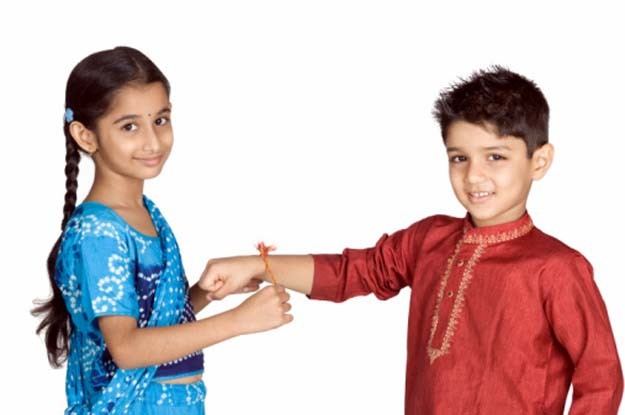 As a young girl, I never knew the actual meaning of Raksha Bandhan. I celebrated the day because my Mom said, "It is a special day for brother and sister." I also sent them to my first cousins, as I was the only "sister" among the six of them. It was very important for my brothers and my cousins to receive this gift from me. In my heart I never really knew what it meant, so it was not as important to me, but I did it for tradition. After I got married, I let the tradition go. Forgot the cousins and called my brothers on that day. In the past 11 years, I have sent Rakhi only twice. Last year was the first time I felt like doing it. So, I did. The response from my brothers was amazing! It seemed like a fire was rekindled. We started talking more often and a relationship started to build again. Over the years, with marriage, work, children, I drifted away in actual contact, but never in heart. It felt so good to have my brothers call me and say "thank you" and "I love you". To hear those words after so long was the most wonderful feeling in the world. One day I was thinking about how it was when we were young. How mean I was as the older sister, bossy, mean and fighting with them. I never thought in a million years I would ever miss them or wish we were kids again, just for one day. I realized how I took for granted the special times of our youth. I realized what a special bond we have with each other. I realized they will always be there for me, no matter what. In that, I have found great comfort and the regrets of days past linger no more. But are filled with cords of a love song that only my brothers can sing. I thank God for blessing me with them. I am proud of all they have accomplished. It brings a smile to my heart when I see the two little boys who grew up to be very amazing men. This bond of sacred love between a brother and a sister, means more to me than a tradition, it is more than my protection from my brothers. To me, Raksha Bandhan is a symbol of the love, respect and honor I have for them. I want to be love every person.. happy raksha bandhan. Such a beautiful piece! I so understand how u feel!